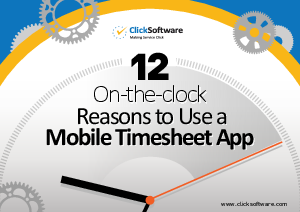 There are certainly many reasons that service businesses should be using mobile timesheets. And with mobility so commonplace in the enterprise market today, it makes sense to place as many time saving, streamlining, simplifying apps as possible on the mobile phone. Especially since most service businesses have field workers that rarely come to the office anymore. So we have come up with 12 on-the-clock reasons why we think field service management is the perfect place for a mobile timesheet app. With the addition of predictive technologies and seamless mobility to the back office, we are sure that the entire workforce management team will be right on time. Download this e-Book now to find out more.